Hi there! I know some other horses around here like to brag, but I think I have earned the bragging rights. My name is Josh; my show name is Jivago. I am a registered Selle Francais and I know there are no others like me here. I am one of a kind and a character too. I guess you could call me the ‘class clown’ or some people say I have ‘lots of personality’- all of the above! I was donated in June of 2009 by Debbie Bass of MayPine Farm. I was her show horse for a few years and we really cleaned up on the ‘A’ hunter circuit. That sure was lots of fun, but also a lot of work. I prefer to be on the lazier side, so after a few laps I get tired and it takes a lot of encouragement to keep me moving forward. I retired from the show circuit at an early age; the jumping wasn’t good for my rear suspensory ligaments. I bet you are surprised that I was born in 1997. Seems like I did a lot; ridden by children and adults, successful show career, traveled a lot, and developed quite a reputation for myself – lots of people know me on the circuit. I am a very popular guy. How could I not be, 16 hands tall, bay, awesome mover, eye catching – I sound perfect! I am very good with most ring activities, however nothing on my ears please. I stand very well to be groomed, but if I get bored or don’t think you are paying attention, I may toss my head or start to paw. I love to be the center of attention. You will notice I wear bell boots up front to keep me from pulling off my shoes and instructors will wrap my rear legs for class. I have to protect this body – I want it to last. I love being here and I get a lot of attention. I like to think a lot and sometimes I need to be reminded of what I am supposed to be doing. So even if you don’t get the privilege of working with me right away, you will. I plan to stick around for a while. I have lots to teach my riders here. This is fun! I hope to meet you soon! Please stop down and visit me. 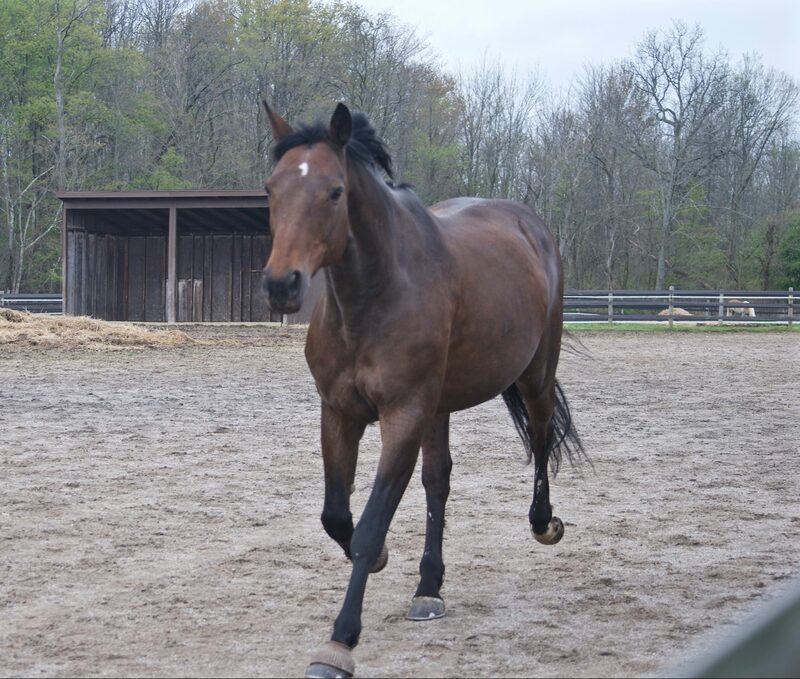 I’m the gorgeous bay gelding – you can’t miss me! Also, if you bring me treats, I have a ground feeder, (not a corner feeder), and you may have to look a little closer for it – sometimes I hide it in the stall. I am always doing something for entertainment.